In the mining towns in Northern England, the miners used to eat something called a pasty. 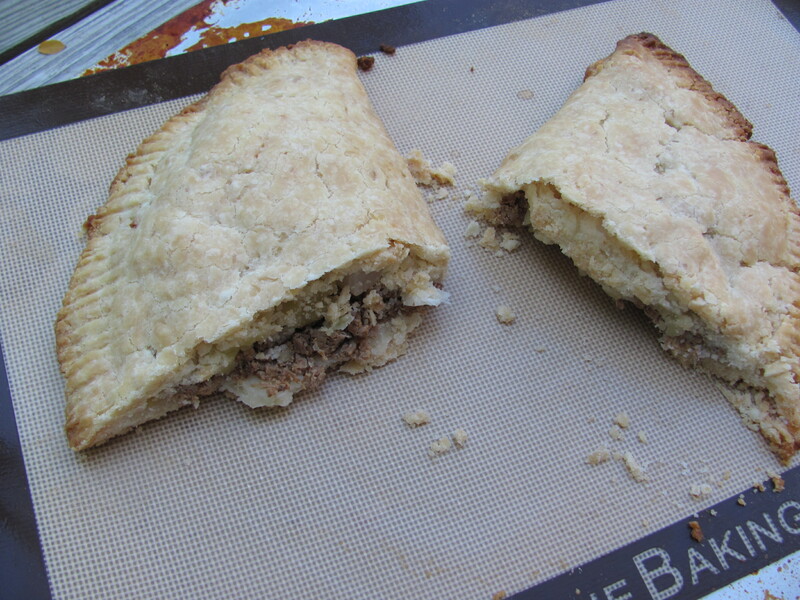 Made of leftover meat, potatoes and turnips, it’s a suet crust pastry. The idea was to eat only the interior of the pastry–eaten with dirty fingers, the edges would be contaminated with arsenic from the mines, so you would just discard the edges, and thus avoid the arsenic. This doesn’t involve arsenic, but it might as well have: some gluten-free things are easy to make; some, take weeks. The gluten-free pastry mix was the easy part. To find suet, where you live, outside of the U.K., you need a real butcher–here that means calling Whole Foods. I asked if they had suet. At first they couldn’t understand what I was saying, “What?” I explained; then, they did seem to comprehend. Someone in the background yelled: “Suet?” After a few muffled seconds, the voice on the phone asked how soon I could get there. When I walked up to the meat counter, which is at the front of a very large butcher shop, and said, “Suet?”, there were several guys standing behind the counter. They started passing the word suet back and forth to each other. “Suet?” “Suet?” One of them walked up to the counter and said, “That would be Lee.” Lee asked, “How much do you want?” I said, “How much do you have?” Lee said, ” A hundred pounds.” I said, “Let’s start with five.” Lee bagged it up and one of the other guys behind the counter said, “Suet?” again, as if he were singing it. Two or three more of the counter guys started singing the word, “Suet,” to each other across the butchershop. “Suet” , “Suet”. They sang it to each other, grinning. To prepare the suet: Make sure the suet is well thawed in the refrigerator. With clean hands, pick the fat apart from the membranes, making sure that none of the membrane is left in the fat. When you have about a cup, take the pieces of suet and grind them up in the food processor until you get a suet meal. To prepare the pastry: Pour the pastry mix and baking soda into a mixing bowl. Add the suet meal and the lard. Add two tablespoons water and mix well. Beat the eggs, cider vinegar, and about eight tablespoons of water together. Pour all of this into the pastry mix and cut it together with a fork. If it’s wet enough to form into a ball, you’re done. If not, keep adding water, a couple of tablespoons at a time until you can form the dough into a ball. (You’re trying to keep the dough dry; fat is really what makes this hang together, not water.) Once the dough is in a ball, refrigerate for one hour. A few days before, put some kind of meat into the crock pot and cook it overnight, until it’s falling apart. I used chuck steak, because that is the cheapest meat I could find. Finally, take the chilled dough out of the refrigerator. Divide the ball in half. Put a silpat on a plate. Turn the oven on to 425 F, to preheat. Put the ball of dough onto a silpat, and flatten it. It will come apart a little. Sprinkle water onto the dough and moisten the pieces back together. Put a piece of plastic wrap on top of the dough. Roll the pastry flatter and thinner with a very sturdy glass. Pull up the plastic wrap and moisten the dough with water along any miniature fault lines that have developed. Put the potato, turnip and chuck steak on one half of the pastry. Add some salt. Pull up the edge of the silpat and bring the top half of the pastry crust over the filling. Seal the edges with a fork, and smooth out any cracks in the dough with water. Put the whole thing in the oven on a cookie sheet for 45-50 minutes. Heaven. Cost: About $9.00 to serve two or three. Absolutely brilliant! Love your line about the life you were meant to have… totally relate! Thanks! Years later, this is still one of my favorite posts.